Impressions Reviews Written By: Jonathan A. Nuclear Throne is another one of those games that takes me back to the days of arcade shooters with a heavy lean on spatial awareness and high replayability no matter how many times the game kills me. Sure there are plenty of games out there that do the “bullet hell-esque” theme now, but most of them are done with planes or spaceships and it’s neat to be taken back to the days of Smash TV. The biggest difference is that you’re not going to win a toaster at the end of this game. The crystal dude is one of my favorite characters and with one of the updates I discovered one of my new favorite guns too. I do love me the minigun. One of the first things you’ll probably notice is the simple aesthetics of the game. If this bothers you, get over that quickly as it does not detract from the game while adding a good old fashion retro look. They could have gone with a different approach and made it more hyper-realistic, but they did not. A lot of games are going for the retro look lately. Meh, whatever. I happen to like it. 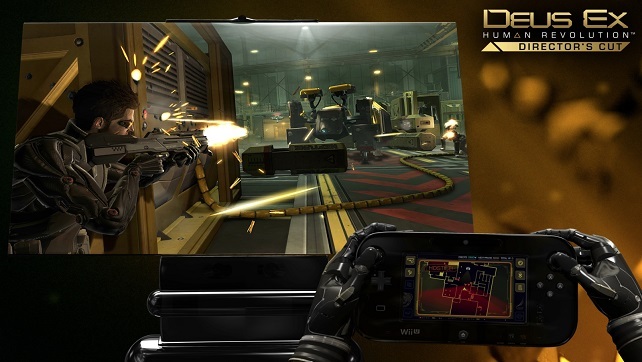 It reminds me of my glory days with NES games… but with better/faster processors and smoother gameplay. 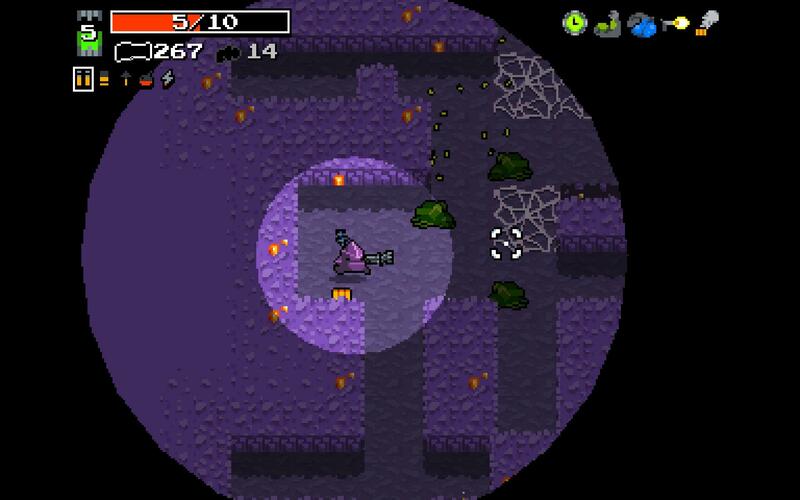 The second thing about Nuclear Throne is that the controls very responsive and super smooth. (Mouse-look over funky twin-stick mechanics = yes please!) 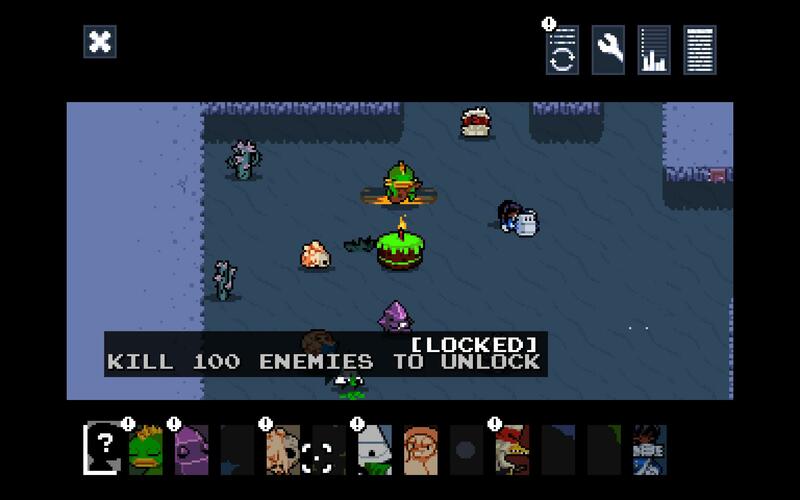 Chances are that if you bite it before reaching the Nuclear Throne, you could have actually dodged whatever it was that killed you. I’m not here to say that I have reached the end, but play for a while and you’ll understand that while there may be a lot of crap flying on the screen, you don’t always need to be neck-deep in it. You move rather quickly and/or have some form of defensive ability. You should probably use them, but nothing really beats just not being in the same place as a bullet in the first place. Think guerrilla warfare tactics, that will help quite a bit. It’s not really a timed game so why rush it? In what other game can you play a crazy looking chicken wielding a katana? A lot of good choices to play with here… there are some that I’m just horrible with, but that’s because I haven’t given them enough time to figure out if I like them or not. That is except for the plant guy… we just don’t work well together. Already there are multiple characters to play with ranging from a roided up dual-wielding hulk of flesh to a robot that eats guns all the way to a chicken with a katana. There is quite the variety and much to my delight, they all actually play differently with different pros and cons. Sure they all move and attack, but there are buffs to damage or dodge, or even slowing time. I love that there are so many characters and they are all unique. It’s a very impressive feat since some AAA games can’t seem pull that off. Granted, they are developing games in a different setting where a katana wielding chicken wouldn’t exactly fit, but the principle still applies. 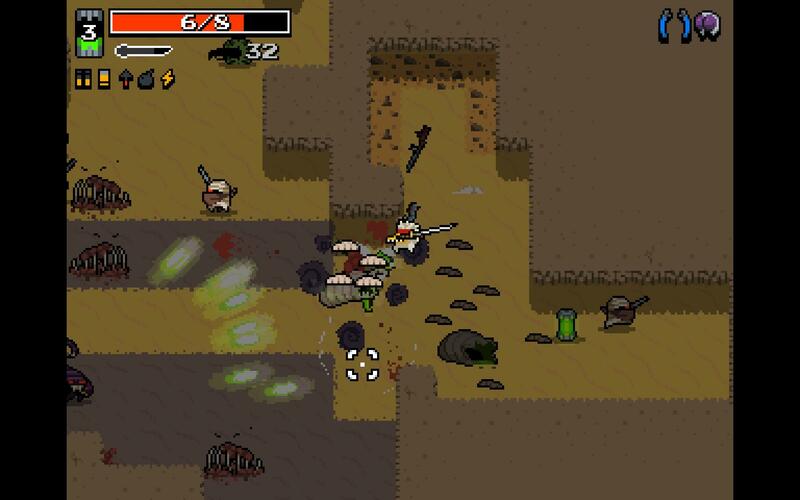 Nuclear Throne is labor of love and the game is just simple and fun to play. It can be frustrating as it does get a lot harder as the levels go on, but with some time and dedication you’ll be bobbing and weaving like a boss (hopefully). It is one of those games that is easy to learn yet hard to master. With multiple characters that all have distinct looks and characteristics, there is plenty to try out and play the game over again. Can you get to the end? Try new character since the levels are randomly generated. Are you like me and can’t? Then just enjoy what you can work through and slowly get better with more practice. Good times will be here.